RARELY is punk music associated with delicate US artist TORI AMOS. 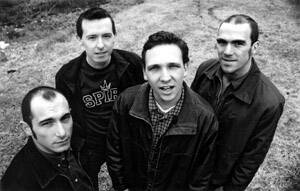 But since Melbourne punk act BLUE LINE MEDIC (pictured) recorded its version of Amos' track PRECIOUS THING, perceptions have changed. The four-piece band is preparing to release its version of the song on a new EP. Known for its raving punk tunes and touring with the likes of ONE DOLLAR SHORT and AREA 7, Blue Line Medic has added a new slant to Precious Thing. The band's frontman DONNIE DEREAU learnt the chords to the track a few years ago. 'I wondered what I could do with it and so I started playing a rock version of it and when I showed our guitarist Adrian he was pretty impressed,' Dereau said. The band recently resurrected the song to release it on the upcoming NEW.OLD.RARE EP. The band will share the EP with Sydney's SECONDBEST and American label mates MIDTOWN and THE MOVIELIFE. The band hopes to begin work on a new album to follow up the release of the 2000 debut THE APOLOGY WARS. Blue Line Medic will perform at the NORTHERN STAR HOTEL tomorrow night with New York's PILOT TO GUNNER.